Why did we read this book: We have read, reviewed, and loved the first two books in the Mistborn trilogy. Naturally, we had to finish the story with this bittersweet, final volume. Who is the Hero of Ages? To end the Final Empire and restore freedom, Vin killed the Lord Ruler. But as a result, the Deepness—the lethal form of the ubiquitous mists—is back, along with increasingly heavy ashfalls and ever more powerful earthquakes. Humanity appears to be doomed. Having escaped death at the climax of The Well of Ascension only by becoming a Mistborn himself, Emperor Elend Venture hopes to find clues left behind by the Lord Ruler that will allow him to save the world. Vin is consumed with guilt at having been tricked into releasing the mystic force known as Ruin from the Well. Ruin wants to end the world, and its near omniscience and ability to warp reality make stopping it seem impossible. She can’t even discuss it with Elend lest Ruin learn their plans! The conclusion of the Mistborn trilogy fulfills all the promise of the first two books. Revelations abound, connections rooted in early chapters of the series click into place, and surprises, as satisfying as they are stunning, blossom like fireworks to dazzle and delight. It all leads up to a finale unmatched for originality and audacity that will leave readers rubbing their eyes in wonder, as if awaking from an amazing dream. 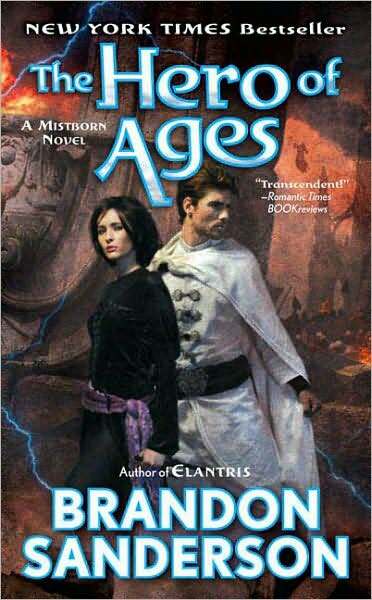 Thea: I absolutely loved The Final Empire (Mistborn book 1), but was somewhat disappointed with The Well of Ascension (book 2) – so I entered The Hero of Ages with some trepidation. There’s no doubting that Brandon Sanderson possesses a flair for world creation and had planted some tantalizing plot seeds…but would he be able to bring it all together in a brilliant, perfect ending? The answer is…sort of. The Hero of Ages is certainly much better than its predecessor, and it brings a dramatic, bittersweet, fitting conclusion to a truly fantastic series. It wasn’t without its weaknesses, though, and still doesn’t manage to live up to the initial sparkle of The Final Empire. Ana: I had a similar frame of mind when I first opened The Hero of Ages. Even though I was not as disappointed with The Well of Ascension, I still thought The Final Empire was a much superior instalment. I did have high hopes for Hero of Ages, expecting it to have the best of both and to close the trilogy with a punch. And you know what? Except for a few caveats, Brandon Sanderson totally delivered. The conclusion of the Mistborn series was both dark and bright, definitely bittersweet but also very, very good. On the Plot: The final empire has fallen, the Lord Ruler is dead, and Vin has discovered the Well of Ascension and has taken and released the power there, as the prophesied Hero of Ages. But everything has gone desperately wrong – an ancient, primordial force called Ruin has tricked them all, and Vin’s selfless gesture of relinquishing the indescribable power at the Well of Ascension has freed this old, destructive god from his prison, and now the end of the world looms closer and closer. The ashmounts, created by the Lord Ruler, to cool down the land enough to sustain human life, are spewing black ash and lava; earthquakes rack the land, devouring whole cities; the mists, ever-repelled by Vin now, appear with increasing frequency, attacking and sickening more people each day. Crops and animals wither, and the land itself is dying under Ruin’s destructive malevolence. All the while, Elend, Vin and the crew travel from city to city, trying to soothe rebellion and unrest in two very important principalities, while they desperately look for the Lord Ruler’s hidden cache of atium – which Vin knows must be essential to saving the world. Thea: It’s no secret that Brandon Sanderson has a gift for storytelling – his world creation skills are amongst the finest I’ve ever beheld, and his ability to write action scenes is unparalleled. And, with The Hero of Ages, he proves himself to be pretty damn good at plotting too, tying up loose ends with some well-conceived and well-executed ideas. The final volume of a series is a monumental task – it’s easier to create an intriguing opener with tantalizing questions and mysteries to hook readers, but trying to make all those mysteries come together in a cohesive, mind-blowing conclusion? That’s something much, much harder to accomplish. And, for the most part, Mr. Sanderson pulls it off. All the questions and suspicions I had from the first two books – the secret of the Inquisitors’ (and Zane’s) spikes, the hidden religion and past of the Kandra, the origin of the mists, the garbled legend of The Hero of Ages, the Lord Ruler’s motivations – all these things become clear in this final novel with a conceivable explanation for everything that has been happening in this mist and ash-shrouded landscape. And, basically, the explanations hold together pretty well. Well, there are some things that left me a little skeptical on further observation. Certain resolutions didn’t quite work – in particular the explanation of the mists and the Hero of Ages myth. I appreciated the way the book ended and the overall explanation for this epic close, but…I can’t help but feel that this explanation didn’t really fit quite right with the earlier books. By accepting the final explanation, the whole impetus for the series – the Lord Ruler’s rise to power and the first journey to the Well of Ascension – doesn’t make any sense (well, I suppose it makes sense, but it’s silly). The ability of Ruin to change written word (except those words written in metal), to overhear every conversation omnisciently, to plot and scheme for eons…it all feels a bit boogeyman-ish and contrived. For all that Ruin isn’t supposed to be “evil” and Preservation “good,” it certainly felt like a polarized villainy. The idea of these two opposing forces is a good idea, but I didn’t particularly buy it, especially in terms of execution. My other main complaint concerned the effectiveness of the length and multilayered plotlines. A lot of things happened over the course of the book as the narrative jumps to different characters and their separate stories, but some of these plotlines ultimately amount to naught in terms of the overall conclusion. These different parts allow the reader to understand what has happened and why, but these explanations and plot points are virtually useless otherwise – they don’t play any real part in the overall arc. In particular, Spook’s entire storyline in the city of Urteau and his discoveries and actions there doesn’t really affect anything, upon reflection. What Spook learns, Vin and a certain other character are able to figure out on their own. Similarly, TenSoon’s singleminded dedication to reach Vin doesn’t really amount to anything directly either. Even the siege at Fadrex and all the drama with King Yeomen ultimately amounts to nothing in terms of overall significance! I loved reading about these different threads of the story, I loved seeing more of two favorite characters, but from a critical standpoint these lengthy and entertaining storylines are the literary equivalent of empty calories. Now, it may sound like I didn’t like the story – and that couldn’t be farther from the truth. I really liked this book. Heck, I loved it. I loved the different types of magic and their explanations, in depth here (Allomancy versus Feruchemy versus Hemalurgy). But these flaws in the story and the almost deus ex machina type ending kept me from loving it with the reckless abandon that I had for The Final Empire. 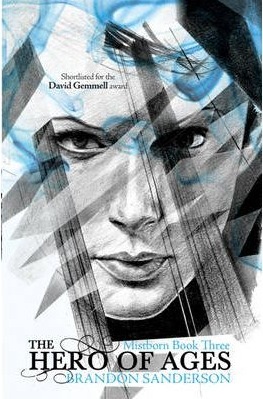 With this tantalising bit Brandon Sanderson opens his final volume in his amazing trilogy. The line is, even in its shortness everything that is right about the series. It points to both plot (Who is the Hero of Ages is a central question of the trilogy) and character (the “unfortunately” shows that being the Hero of Ages does not come without sacrifices) . It is also part of something I really liked throughout the trilogy: the quotes that open each chapter. In this particular one, the quotes are very revelatory, finally answering those questions I had been waiting for: like the truth behind the Lord Ruler’s actions and what exactly are Allomancy, Feruchemy and Hemalurgy. It is also very clear who is writing these from the start which only ads and extra layer of mystery to the plot because how exactly did THIS person become the Hero of Ages? Speaking of which: if The Well of Ascension was mostly a character piece, The Hero of Ages is definitely a plot-centric instalment. It is with this book that it becomes very clear to me what an amazing plotter Brandon Sanderson is. EVERYTHING comes together perfectly and even small, deceptively irrelevant pieces of information from BOOK 1, prove to be essential to the overall story. I was completely awed by some of it and I had quite a few moments where I went “WHOA” . In this point I have to disagree with Thea. I thought everything fit beautifully with the previous books and I was left completely satisfied with the entire overreaching arc – the historical one between Ruin and Preservation and the localised one that dealt with these particular characters. (Although I have to agree that the two forces did seem polarised between Evil X Good despite the attempt of making it not so.) . This (apparent) division between two storylines – the one that began a long time ago and which have Forces of Nature fighting and the one that has Elend and crew trying to survive it, was extremely well done. BUT there is a lot of it. And here I have to agree with Thea 100%: some of the plotlines were completely useless even if they were interesting. I have to admit to loving Spook and TenSoon as characters but the amount of time spent with them only hindered the overall experience, delaying the progress of the story. In my not so humble opinion, this is another example of a book that needed heavy editing, cutting back pages and pages of useless storylines. To the point where I believe this trilogy would have worked far better as a two-book series. As it stands, the trilogy is an uneven ride: slow in points, fast paced in others. Remove some of these storylines from both book 2 and 3, unite the two into one book and ergo: you have a fantastic rollercoaster packing a much more effective punch. Not that the series doesn’t go out with a BANG! Quite the opposite, the final 150 pages of the book, once all the irrelevant secondary stuff was taken care of, and we reach the resolution (which includes the demise of VIPs), were absolutely, undoubtedly brilliant. Had the book been more focused and more centralised, I have no question in mind that instead of “brilliant” I would be using the word “spectacular”. Ultimately though, despite its flaws, I loved this series. Thea: I have come to an important conclusion whist reading The Hero of the Ages. Brandon Sanderson’s characters only have two speeds: Badass and Emo. There is no in between. Characters will oscillate from self-pitying emo whiner to deadly, awesome decisive badassness, without any middle gradation. This is something I find incredibly infuriating – I like characters to be vulnerable and to question their decisions, but when it goes on for the entire 700-plus pages, it’s a tad ridiculous. You will have seen this phenomenon in The Well of Ascension with Elend’s whiney introspectiveness, Vin’s self-doubting (How could Elend love someone like ME! *dramatic hand over face*), heck, even Breeze’s posturing about Cett’s daughter. In The Hero of Ages, it’s poor Sazed, torn up and faithless after the death of Tindwyl. Emo!Sazed is a character that had ME wanting to drive hemalurgic spikes into my eyes because of how ridiculously mopey he was for the. enitre. book. That said, there were characters I was thrilled to see again, and in depth. Since The Final Empire, one of my favorite side-characters was Spook, the tineye member of Kelsier’s original crew. In The Hero of Ages, Spook plays a much larger, pivotal role in the story. Also returning to a major plotline is TenSoon, the kandra that killed and usurped OreSur’s place in The Well of Ascension. As for our intrepid heroes, Vin and Elend? I was not cool with Elend being a badass all of a sudden – yes, I know it’s a full year after the events at the Well of Ascension, but it felt a bit easy to have Elend all of a sudden gain strength and allomantic prowess after all his struggles in the second book (especially his insecurities concerning Vin and her incredible power). And yet, I was more than happy to see a departure from Emo!Elend and his constant self-doubts and questions. Vin, once again, is the true hero of this novel – she’s back in top badass form, and fights long and hard. She’s not infallible, and she gets into her share of tough scrapes – but even without allomancy to help her, she’s a fighter and proves her mettle once more as a heroine worth everything. Ana: First of all, I do need to give Thea the kudos for summarising brilliantly the two speeds of the characters (and for me making me laugh so hard). This is unfortunately very true for most part. It is also true that thankfully, the worst of internal monologue was left behind in the Well of Ascension. I mean, there is still a lot of self-doubt in this book (if I had to hear one more time Elend thinking about the distinction between being King x being a Scholar, I would have gladly stood in line behind Thea to get those spikes into my eyes too ). Sazed got the blunt of it this time around – the mopping about the religions and loss of faith was incredibly…well, boring to be honest. But of course it all came back to bite me in the behind when the connection between his religious knowledge and how exactly it fit in the overall story was revealed (for your information, that was a “WHOA” moment). Gotta give Brandon Sanderson the props for playing this card. Damn him, and I say that in a most reverent manner. Despite the moodiness and the Emo moments though, I am a sucker for the badass mode specially Elend’s. PLEASE, give me Badass!Elend any time over Emo!Elend. When he became a Mistborn at the end of Well of Ascension I had my concerns and I was afraid he would steal Vin’s thunder but I am pleased to say that this does not happen. They both have their strengths and they play according to it even if they spent most of the book apart. That fit really well with who these characters were: Elend, the new Emperor dealing with the political side of the situation and Vin going on her own to deal with the metaphysical aspects. I liked to read these two characters’ evolution from book 1 to the final book. Finally, I need to mention the Lord Ruler, the tyrant who was killed at the end of The Final Empire. Even though he is dead and gone, and is not a physical presence anymore, I absolutely loved to learn more about him. From the end of The Final Empire it was very clear that he was more than an eeeeevil villain but just how much more was really cool to learn in this book. Vin remains my favourite in the entire trilogy and the most memorable character. Thea: Though not without its weak points, The Hero of Ages is a fitting, bittersweet end to a wonderful trilogy. I loved this powerful conclusion, and I absolutely cannot wait to read more from Brandon Sanderson. Ana: The Hero of Ages is a great, final book in an extremely well-plotted and very (VERY) original Fantasy series which I highly recommend. After reading both this and Warbreaker this year, I am fully aware of the author’s strengths and weaknesses and the former far surpasses the latter. I am reading Elantris ASAP. Fatren squinted up at the red sun, which hid behind its perpetual screen of dark haze. Black ash fell lightly from the sky, as it did most days lately. The thick flakes fell straight, the air stagnant and hot, without even a hint of a breeze to lighten Fatren’s mood. He sighed, leaning back against the earthen bulwark, looking over Vetitan. His town. Druffel scratched his nose. His face was stained black with ash. He hadn’t given much thought to hygiene lately. Of course, considering the stress of the last few months, Fatren knew that he himself wasn’t much to look at either. “An hour, maybe,” Druffel said, spitting into the dirt of the bulwark. Fatren fell silent. He didn’t like to voice his doubts; he was supposed to be the strong one. When the lords had left the town—a farming community, slightly more urban than a northern plantation—Fatren had been the one who had convinced the skaa to go ahead with their planting. Fatren had been the one to keep the press gangs away. In a time when most villages and plantations had lost every able- bodied man to one army or another, Vetitan still had a working population. It had cost much of their crops in bribes, but Fatren had kept the people safe. The sad thing—the thing that was really disheartening—was that Druffel had once been the optimist. Fatren hadn’t heard his brother laugh in months. That laughter had been Fatren’s favorite sound. Even the Lord Ruler’s mills weren’t able to grind Druff’s laughter out of him, Fatren thought. But these last two years have. Fatren looked up as a young boy scrambled along the side of the bulwark. They’d barely finished the fortification—it had been Druffel’s idea, back before he’d really given up. Their town contained some seven thousand people, which made it fairly large. It had taken a great deal of work to surround the entire thing with a defensive mound. Fatren had barely a thousand real soldiers—it had been very hard to gather that many from such a small population—with maybe another thousand men who were too young, too old, or too unskilled to fight well. He didn’t really know how big the koloss army was, but it was bound to be larger than two thousand. A bulwark was going to be of very little use. Fatren turned to Druff, who wiped his nose and shrugged. They followed Sev around the inside of the bulwark, toward the front gate. Ash and dust swirled on the packed earth, piling in corners, drifting. There hadn’t been much time for cleaning lately. The women had to work the fields while the men trained and made war preparations. War preparations. Fatren told himself that he had a force of two thousand “soldiers,” but what he really had were a thousand skaa peasants with swords. They’d had two years of training, true, but they had very little real fighting experience. A group of men clustered around the front gates, standing on the bulwark or leaning against its side. Maybe I was wrong to spend so much of our resources training soldiers, Fatren thought. If those thousand men had worked the mines instead, we’d have some ore for bribes. Except, koloss didn’t take bribes. They just killed. Fatren shuddered, thinking of Garthwood. That city had been bigger than his own, but fewer than a hundred survivors had made their way to Vetitan. That had been three months ago. He’d hoped, irrationally, that the koloss would be satisfied with destroying that city. He should have known better. Koloss were never satisfied. Fatren climbed up to the top of the bulwark, and soldiers in patched clothing and bits of leather made way for him. He peered through the falling ash across a dark landscape that looked as if it were blanketed in deep black snow. A lone rider approached, wearing a dark, hooded cloak. “What do you think, Fats?” one of the soldiers asked. “He has a horse,” Druffel said with a grunt. “We could use another of those.” The city only had five. All were suffering from malnutrition. “Merchant,” one of the soldiers said. “I’ve never seen a refugee with a horse,” one of the men said. He raised a bow, looking at Fatren. Fatren shook his head. Nobody fired as the stranger rode up, moving at an unhurried pace. He stopped his mount directly before the city gates. Fatren was proud of those. Real, true wooden gates mounted in the earthen bulwark. He’d gotten both wood and fine stone from the lord’s manor at the city center. Very little of the stranger was visible beneath the thick, dark cloak he wore to protect himself from the ash. Fatren looked over the top of the bulwark, studying the stranger, and then he glanced up at his brother, shrugging. The ash fell silently. The stranger leaped from his horse. He shot straight upward, as if propelled from beneath, cloak whipping free as he soared. Underneath it, he wore a uniform of brilliant white. Fatren cursed, jumping backward as the stranger crested the top of the bulwark and landed on the top of the wooden gate itself. The man was an Allomancer. A nobleman. Fatren had hoped those would all stick to their squabbles in the North and leave his people in peace. Or, at least, their peaceful deaths. You can read the full chapter online HERE. Additional Thoughts: Brandon Sanderson, in addition to penning the popular Mistborn, Elantris books and Warbreaker is also the author who was chosen to pen the conclusion of the late Robert Jordan’s Wheel of Time series. You may have heard of it. 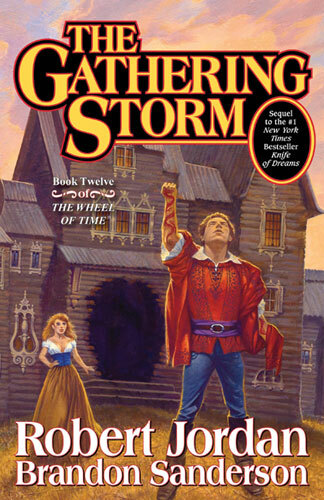 The Gathering Storm, the first of the three final novels started by Robert Jordan before his death in 2007, is now out in bookstores and has DISPLACED the formidable Dan Brown with his The Lost Symbol atop the New York Times Bestseller List. Huzzah! I’ve been curious to find out what your thoughts were on this book! I loved the first book, second was okay (to be fair, middle books are always difficult) and third, well, liked it well enough, but struggled with the ending. It was a bit too… epic for me. I agree the magic system and world-building is very original (and very different to Elantris, which I did like very much), but the one thing with Sanderson’s writing is that I find it hard to connect with the characters. The romantic relationships never ring true to me, and with my romance reader roots, that’s something which I need to believe in! much as i love the WoT series and can’t wait to read TGS (honking doorstopper that it is), i still really dislike the cover art of this series. has always struck me as amateurish, somehow, in terms of facial expressions and proportions. i’m excited and afraid in equal measure of how it’ll turn out, new author-wise!